Bodrum centre is famed for its pretty scenery, its historic castle, quaint cafes, swanky expensive bars and restaurants. And, of course, its (very probably) world famous outdoor nightclub, Halikarnus. The town’s reputation for uber-noisy nightlife means other attractions can be overlooked. We skipped out on Bodrum visits for many years after one noisy summer weekend visit many moons ago. Now, however, a few years on and a few years (hopefully) wiser, we know not to dismiss places like this. There’s always more to see. In springtime, when all was chilled and serene, we took ourselves off to the Bodrum Peninsula once more; it was the Bodrum Global Run, we were aiming for a bit of scenic appreciation by way of exploring more of the town and nearby areas such as Yalıkavak and Gümüşlük and, for the cultural part of our itinerary, one of the places we visited was the Zeki Müren Arts Museum in the centre of Bodrum. Bodrum centre isn’t huge and finding the Zeki Müren Arts Museum isn’t difficult. It’s on a street bearing his name – that’s how famous and much-loved he was, and still is – and is just a short hop away from the entrance to Halikarnus nightclub. But, with only a few days to play with, what was it that made us want to to take some time out of one of those days to wander around this home-now-museum? Because, for millions of Turkish people, Zeki Müren is the Elvis Presley of the country; a true superstar who starred in numerous films and recorded many albums. But he was acknowledged and appreciated for so much more than that, too. Let us explain as we take you around the Zeki Müren Arts Museum. If it wasn’t for the Zeki Müren statue standing outside the museum, it would be easy to walk past this whitewashed building. The vast majority of buildings in Bodrum are whitewashed and flat-roofed so this is not a construction that jumps out at you. That was the first thing that struck us. Zeki Müren’s fortune must have been immense. He was famous for his huge stage presence, flamboyant costumes, shoes, make up and jewellery…and his home was anything but the mansion-type abode we were expecting. He moved to his beloved Bodrum in the 1980s to live a more quiet lifestyle after ill health struck and his home seems to reflect that. There’s a bit of an English introduction to the life and times of Zeki Müren in the entrance hallway, but, after that, all is in Turkish. Don’t let that put you off, though. Do a bit of reading (and watching and listening) around Zeki Müren and this little peek into his life – his final home – is fascinating. We read the English-language biography in the hallway and then spotted a sign (in Turkish) asking us to wear galoshes before entering. In a box below the sign were plastic shoe covers. Major rule of Turkish culture: Thou shalt not cross the threshold of the home in outdoor footwear. It might be the Zeki Müren Arts Museum but it was also Zeki Müren’s home. We obeyed and placed the galoshes over our shoes before going inside. Amongst the furniture of the home, Zeki Müren memorabilia is displayed and his music plays throughout the house. We didn’t realise how much of it we knew until we were touring around the rooms! There’s some ornate gilded furniture in the rooms; the style that you might expect from a star whose image is often compared to that of Liberace but everything else feels so homely. It almost felt like we were intruding, especially as we were the only two people in there. And especially when you see the artwork of Zeki Müren. As well as being a classically trained singer, composer, poet and actor who also composed many of the scores to his films, he also liked to paint in his spare time. Apparently, this was just a hobby but many of his paintings are on display throughout the house. And this is where we started to wonder a bit more about the personal life of Zeki Müren. I took a photo of this painting because it’s called ‘Mutluluk’ (Happiness). This was the only one we spotted that was upbeat. Maybe he painted mostly when he was feeling down because so many of the other titles were about melancholy, loneliness and sadness. A poem on the wall, written for him by someone else, is also about friendship and loneliness. Apparently, Zeki Müren never actually came out and announced to the outside world that he was gay but it is widely assumed that he was. He is revered by many in Turkey as being a pioneer; he was the person who, in 1950s and 1960s Turkey, made it okay and acceptable for a guy to want to wear make-up, blow dried hair, dress in feminine clothing and wear bejewelled necklaces, bracelets and rings. He is as respected for that as he is for his immense musical talent. He was the Turkish star. If there are people around who think badly of Zeki Müren, we’ve never heard them say it in public. On the anniversary of his death on 24th September, he usually crops up in conversation with Turkish friends. ‘Pasha’ and ‘The Sun of Classical Turkish Music’ (Klasik Türk Müzigi’nin Sanat Güneşi) are two widely used nicknames or affectionate titles for Zeki Müren. A Pasha was a high ranking military official in Ottoman times and Zeki Müren was known as the Pasha of Turkish Music. He is hugely respected by many. As we were leaving the Zeki Müren Arts Museum and thanking the staff at the desk, they made sure to remind us there is a museum shop behind the house, via the small garden. It’s not obvious and we’d have missed it if they hadn’t said. We felt we should go out of politeness, being the only visitors in the place. We passed the car of Zeki Müren – again, in a huge glass display. Eventually we arrived in the standard museum shop where one of the girls from the front desk miraculously appeared at the till. We have two English friends who had just got married, who love all things vintage, all things Turkey and Zeki Müren, too. What better little pressie than a set of Zeki Müren coasters and make-up mirror, eh? And for us? Well, it had to be a Zeki Müren fridge magnet bottle opener. Those were our souvenirs from our little jaunt to Bodrum! 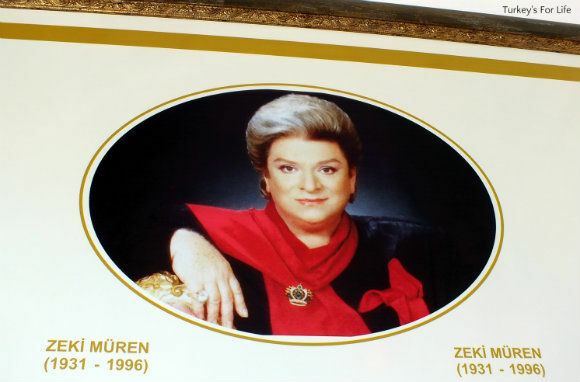 After a few years out of the limelight due to ill health, Zeki Müren was invited to Izmir to receive an award on 24th September 1996 – the first microphone he used whilst singing on TRT Radio. Whilst he was on stage receiving the award, he collapsed and died of a heart attack. He was 64 years old. Zeki Müren was loved (and still is) by people of many ages and from many backgrounds both nationally and internationally. His public funeral was attended by thousands and he is buried in his home city of Bursa. Zeki Müren Sanat Müzesi (Arts Museum) is on Zeki Müren Caddesi in the Kumbahçe area of Bodrum centre. The museum is open daily except Mondays 09:00 – 17:00. It closes for one hour between 12:00 and 13:00. Entrance fee (spring 2016) is 5 TL. There is a museum shop where you can also get snacks and hot drinks to the rear of the museum. There are lots of music and video tributes to Zeki Müren and his music on You Tube if you want to hear his music and see his performances. He always sat at the same table in the same bar and would smile and wave as we passed by. When he wasn’t at the table, a single rose in a vase let everyone know that it was Zeki’s place.